My passion has always been to empower my clients as they achieve their goals for physical and emotional healing. Whether you're looking for a Toronto psychotherapist, training in EFT and energy psychology, or other holistic approaches to total wellness, my practice is here to witness your process and provide whatever support you need. 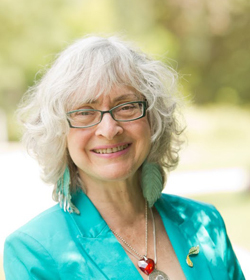 I have been in private practice as a psychotherapist in Toronto since 1977, specializing in self-esteem, violence against women, assertiveness training and conflict resolution. Since 1996, I've added new tools that have helped my counselling practice to evolve and grow: energy psychology, EMDR and therapeutic grade essential oils. I offer therapy for individuals, families and groups, as well as practical workshops on a variety of therapeutic and healing modalities. I have presented at professional conferences on trauma, sexual assault, panic attacks, and energy psychology. I also provide conflict resolution with Toronto social services agencies and organizations in Southern Ontario. My training in psychotherapy includes Redecision Therapy, Transactional Analysis, Gestalt and Bodywork, Cognitive Behavioral Therapy, as well as Advanced Energy Psychology (AEP), also known as Energy Diagnostic & Treatment Methods - and other energy models such as Emotional Freedom Technique (EFT), Thought Field Therapy, Eye Movement Desensitization and Reprocessing (EMDR) and Touch for Health. Certified Practitioner and Level 4 Trainer in Advanced Energy Psychology (AEP) aka Energy Diagnostic & Treatment Methods (EDxTM). Registered Psychotherapist, CRPO (College of Registered Psychotherapists of Ontario). Photo used under Creative Commons License from Hamed Saber.